If you work in construction or manufacturing, then working at high heights is likely a normal part of your week. To people that don’t traverse roofs, towers, or tall machines on a regular basis, the 1st question they ask is: where’s my safety harness? When you’re used to it, though, you may neglect standard safety protocols. Just think about how many people don’t wear their seat belts when they drive. When you do something day-in and day-out, it’s easy to let complacency take over. Those are some sobering statistics, aren’t they? Hopefully these numbers will remind you to wear your harness equipment every time you have to work at heights. 1. Slip the harness over your shoulders as if you were putting on a backpack. 3. Make sure there is no slack. Stand up straight and adjust the length accordingly for a snug fit. 4. Make sure the loose ends of the straps are tucked into the strap retainers. 5. If done correctly, you should be able to fit your fingers under your leg straps with your hand held flat. 6. Make sure that your harness is snug, but not tight. Your arms and legs should still have full range of motion. 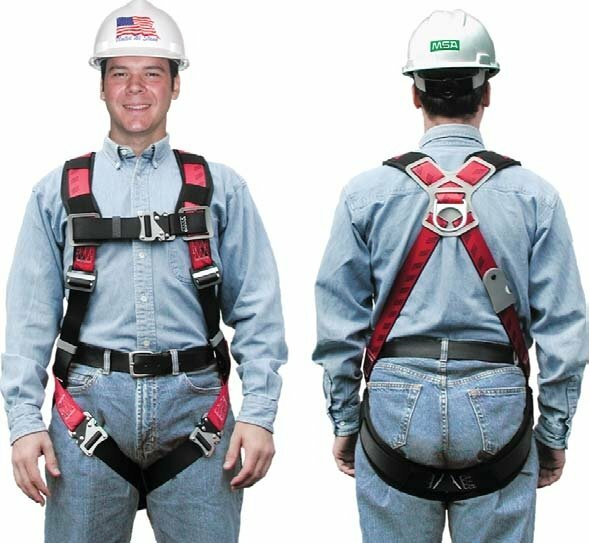 You can purchase fall protection kits, just harnesses, or just accessories right from our online store. Free shipping on orders over $100. Get it now while supplies last!